If you have 2 PCs and need to use them at the same time,the DKVM-2KU saves you the money and space by allowing you to control your 2 computers from a set of keyboard, monitor and mouse. Or, you may have a better,bigger monitor and want to connect both PCs to it, the DKVM-2KU allows you to do this. 2 sets of cables are attached to the KVM switch ready for use, dispensing you of the need to prepare separate cables and connect them to the switch. The DKVM-2KU utilizes advanced microprocessor emulation to intelligently manage each KVM port. This allows simultaneous boot-up of all attached PCs. Auto scan, audible feedback, and keyboard "Hot Keys" make the DKVM-2KU simple to use and manage. There is also a control button located on the front panel that allows you to switch between the PCs. The DKVM-2KU supports VGA, SVGA, and MultiSync monitors at up to 2048 x 1536 resolution at 72Hz refresh rate. Support for Microsoft IntelliMouse is provided. 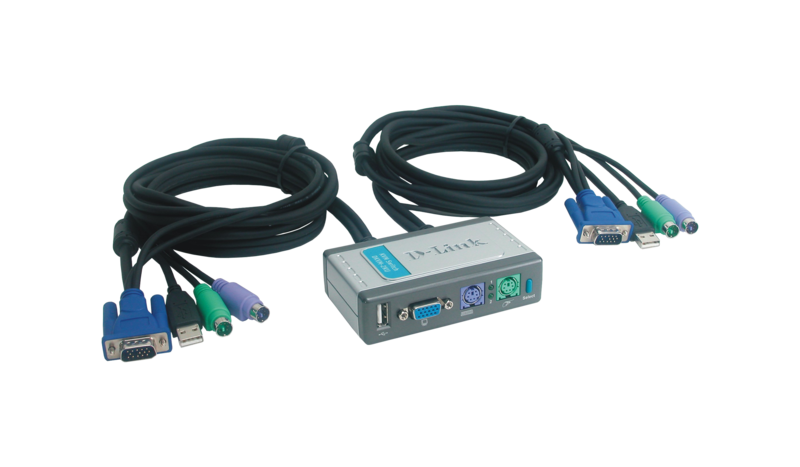 A USB 2.0 port is built into this KVM switch to allow connection to a USB-supported device or a USB hub. This allows you to share your USB printer, scanner, card reader or other devices among the 2 connected PCs. This USB port is also backward compatible with USB 1.1 devices. By connecting this USB port to a USB hub, you can also share more than 1 USB device with your 2 PCs. In the Auto Scan mode, the USB device switching will come with the computer scan sequence.